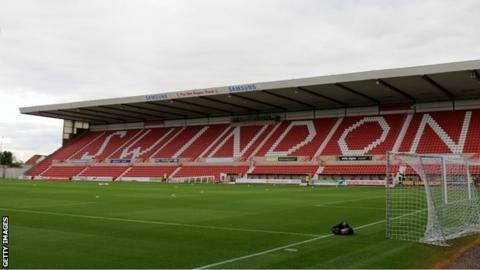 Swindon Town's takeover by a local consortium has been completed after being approved by the Football League. The sale comes three days after manager Paolo Di Canio quit as manager. Banbury United owner Jed McCrory, along with Steve Murrall, Gary Hooper and Callum Rice, have bought 99% of the shareholding in the League One club from Andrew Black. "This is a tremendously exciting time to be taking charge of Swindon Town Football Club," McCrory said. "We are aware of the responsibilities we face taking custody of a club with the heritage of Swindon and we take these responsibilities very seriously." The deal had been agreed on 30 January but could not be finalised until the details had been ratified. Black put Town up for sale because he was no longer willing to invest and he had considered putting the club into administration in order to wipe out £9m of unsecured debt. Outgoing chairman Sir William Patey added: "Andrew Black and the outgoing board leave Swindon as leaders of League One, with a good chance of back-to-back promotions to the Championship. "The quality of our squad is the legacy of the very considerable investment that has been made, and I believe the benefits of this will continue to be enjoyed by fans for seasons to come. "Despite the manager [Paolo Di Canio] walking out on the club, its players and its fans the day before a vital game, Tuesday night saw a wonderful performance from the team under incredibly difficult circumstances. 1 February - Di Canio releases a statement saying he is "considering his future"
21 February - Jed McCrory's consortium completes takeover of the club. "The club's position at the top of the table is a testament to the efforts of those who will now go forward with the new owners. Losing our manager is obviously a disappointment but, as the result at Tranmere shows, Swindon is bigger than any one person." While the future of the League One promotion-chasers has now been secured by McCrory's consortium, they must now begin the search for Di Canio's permanent replacement. The Robins placed midfielder Tommy Miller and defender Darren Ward in temporary charge on Wednesday. Di Canio had voiced his discontent about off-field issues within the club and released a statement two weeks ago saying he was considering his position. His remarks came after Swindon brought in advisors to restructure their finances and a letter was sent to every club in the Football League stating that all Town players were for sale. Just hours after the takeover had been agreed, winger Matt Ritchie was sold to Bournemouth for £500,000 - a deal which the club said was essential because of their financial situation. The decision to sell last season's player of the year was made by Black and the incoming owners and Di Canio revealed he knew nothing about Ritchie's departure until he was told by the player himself. Di Canio was then denied the chance to sign Cheltenham's Marlon Pack and Charlton duo Bradley Wright-Phillips and Danny Green because the Football League would not approve the deals until the sale of the club was complete, and subsequently the transfer deadline was missed. Since releasing the statement on 1 February, Di Canio had refused to comment on his future, but met with the club's new owners last Tuesday. It was in this meeting he handed in his resignation, but made a temporary agreement that he would stay on if the takeover was completed by 17:00 GMT on Monday, 18 February. But the deal could not be ratified in time and Di Canio announced his departure later that day. It is thought McCrory had to seek special dispensation to enable him to hold positions at both Swindon and non-league Banbury until the end of the season, having assumed control of the Southern League club six months ago. Murrall held a directorship, along with McCrory, at a marketing solutions firm and also has experience within the pharmaceutical industry. Hooper, a former professional footballer, has previously worked as a commercial manager at Brentford and QPR.